The Cutting Edge of Ordinary: Moose treats! No not the very large animal with antlers, my Moose. My 12 pound bundle of fury, my constant companion, the shadow that follows me everywhere, and I do mean everywhere (I can’t even go to the bathroom without him sitting in front of the pot waiting). That was probably too much info huh? My Johnny Cash loving, feet warmin’, smotherer of kisses, sweet baby boy, Moose. I realized that he is one member of my family who I have neglected when it comes to the treat department, one very small furry member. I decided it was time to make Moose some home made dog treats. He is fussy when it comes to his treats. If it’s soft and chewy, he gobbles it right down. If it’s a hard biscuit, he puts it in his mouth, walks all over the house, or yard, carrying it between his teeth, crying and whimpering until he buries it. No, we don’t buy him hard biscuits but our mail lady loves Moose and has a treat ready for him every Saturday. He will run to her at lightening speed, immediately sit for his treat and then he’s off to hide it. It’s really comical to watch. I’m sure they are at least 2 dozen biscuits decaying in my yard right now. I searched for days and days for a dog biscuit that didn’t look like it would cook up too hard. I know he’s loves peanut butter, so I thought these would be a hit, and they were. This recipe make quite a few dozen treats. 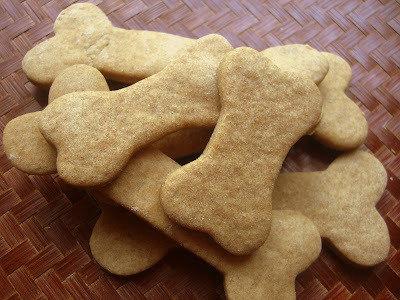 I doubled the recipe and boy oh boy do we have lots of dog treats now! 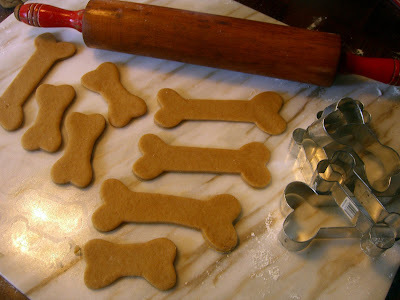 I have 5 different sizes of bone cookie cutters, so I could make different sizes for all our doggie friends. Preheat oven to 350F. Combine oil, peanut butter, and water. Add flour 1 cup at a time, and then knead into firm dough. Roll dough to 1/4 inch thickness and cut with small bone shaped cookie cutter. Bake at 350 for 15 -18 minutes. I pulled them out of the oven at 15 mins so they would be a bit chewier. Move to cookie rack to cool. We even made a Moose, for Moose. See him smilin'? He loved his treats! Okay you are a good doggy mommy. Heh - my kitties follow me into the bathroom, too. And if we have people over and I have to close the door, I see little paws slipping underneath and little whines of "mom? Why can't I come in?" 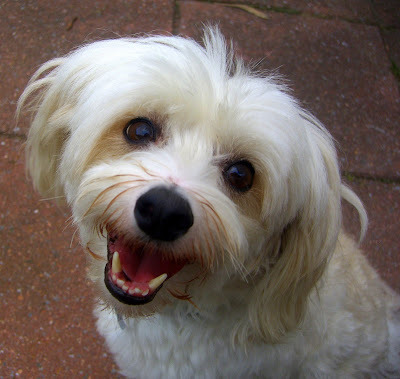 And I agree - you are such a good doggie mommy. I just buy treats. OMG Moose!! We love you! You're so adorable!! Big hugs and ear rubs to you! You are such a lucky puppy to have a mommy bake such awesome treats. Now we're gonna make these for sure, for sure, for sure! Dante and Sierra will love them! I made dog biscuits once. My two dogs gobbled them up fast - probably we were giving them too many. I think Moose Treats are in their future. Lisa, I love your blog as well! 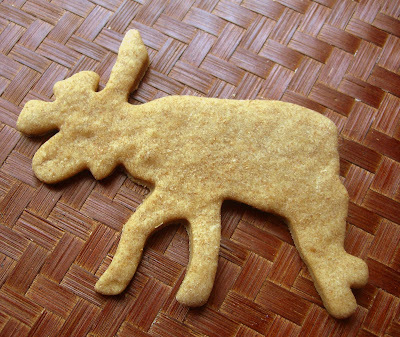 I am so going to make these moose treats for my boys. Elvis has some really bad food allergies, so there are few treats that I can make for him. These fit the bill and I'm sure he's going to love them! I just wanted to let you know I've featured your post in an article I've written for Foodie View because I've made these cookies for my dogs and they loved them.. but more importantly because Moose has the biggest, best smile I've seen in a while. :) The article will be published tomorrow afternoon. What a great recipe, I'll have to share it on my facebook page.